KPLR Channel 11 news in St Louis reported tonite on the alarming increase in property crimes in the cities of Chesterfield and Wildwood, today. 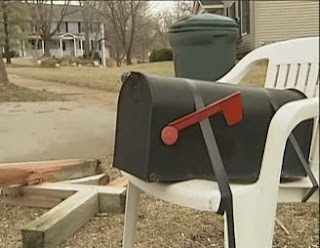 According to police reports, vandals apparently went on a crime spree, stealing 2 cars, breaking into houses, stealing purses and keys and going on joy rides in said vehicles knocking over 19 mailboxes in their path. Chesterfield police report they have no concrete leads at this time. Master Key Systems America are securing homes and businesses in the greater St Louis region. Our conveniently located Creve Coeur workshop and especially equipped service vehicles are staffed by competent and qualified technicians with over 25 years international experience in many facets of the physical security products and services industry. As a neighbor, I am mortified that such crimes are occuring on my doorstep. Protecting yourself, your family, your colleagues and your properties is vital in maintaining your property value, protecting insurance policies from increasing and the true well-being of everyone. Method of entries, according to police reports, suggest burglars kicking in doors, accessing open garages and unlocked cars, taking pocket books and keys. The daring burglars are becoming more desperate during these recent economic times and all citizens need to be wary and secure their properties. 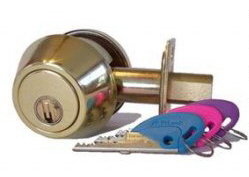 We offer some unique and high quality, aesthetically appealing alternatives to maximise your security applications, including the Strikemaster II frame strengthener, Bilock Extreme Security deadbolts and locksets, Baldwin products and other unique products to help you provide your family and properties with the best defense from intruders. A new product just released, widens the market of products in it's category. The Find It All, offers a unique perspective. Remember when we were children, we used to play the warmer/colder game? Where someone would hide something and make you look for it, giving you clues as to whether you were warmer (closer) or colder (farther away). This new product, cleverly brings that old game to a reallity with this innovative method of a glowing light that increases it's strobe as you get closer to your desired object. The set consists of 2 sturdy key chain tags and 1 very robust flat tag, so you can attach one key chain to your keys, the other to your phone and pop the flat tag in your wallet or purse (of course this is just a suggestion, it's entirely up to you exactly where and on what or who you choose to attach them). Unlike other systems that are either a receiver or a transmitter - the Find it All Key Finder tags are both, so if you've got one, it will find the others for you. Clever huh? Product dimensions (2 x key fob): 0.8(H) x 3(W) x 7(D) cm / 0.3(H) x 1.2(W) x 2.75(D) inches. Product dimensions (1 x flat fob): 0.6(H) x 4.8(W) x 6.9(D) cm / 0.25(H) x 1.9(W) x 2.7(D) inches. 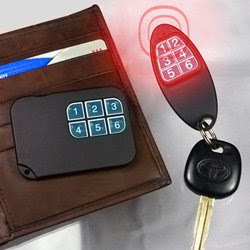 The Ultimate Key Finder set includes 2 x key fob receiver/transmitter units and 1 x flat fob receiver/transmitter unit. Each fob is a two-way device, capable of signalling any other fob to beep and flash, helping you locate the lost item attached to it. To locate a missing object attached to a Find It All Key Finder fob, simply locate one of your other Find It All Key Finder fobs and enter the code corresponding to the item you are searching for. If the missing fob is within range (up to 10 metres / 30 feet) it will begin to beep and flash. Find It All Key Finders also feature proximity detection, whereby the rate at which the fob used to locate another fob is flashing represents the distance between the two fobs. Therefore, the closer you get to a missing item the faster the LED light flashes. Each receiver/transmitter fob unit requires a CR2032 battery (included). Recently, I have been called out on numerous occasions to repair/replace products on clients doors that were previously worked on by untrained and unknowing handymen, attempting to provide services without the knowledge, training or experience that professional locksmiths have spent years acquiring the knowledge for. Client call us to rekey their locks on their home. We inform of our price structure over the telephone. An appointment is booked and our technician arrives early to the appointment. The estimated cost is given again, prior to receiving the "go ahead" from the client. Locks are removed from the doors and taken to the service vehicle for re-keying. Upon inspection of the cylinders, many of the interior parts (the tumblers and springs) are missing. Prior to "fixing" the cylinders, our technician consults the client as to how recently the locks were worked on. The client responds that they were worked on by a handyman/carpenter just days before, but as the locks werent working properly, they decided to have a professional repair after the handyman refuses to honor any perceived warranty. Due to the problems caused by an untrained "handyman", the cylinders take considerably longer and require more parts to "fix", yet the client has already been quoted a cost, so switching prices midway is unethical, inappropriate and not in the best interests of our company. Repairing the cylinders does not take too much extra time, but due to the quantity of cylinders, extra time is multiplied by the quantity. The client is always very happy with our services, because we honor our words and provide value for money. Still, many customers choose to do business with an untrained person rather than call a trained technician, because of the price to value perception. It is true that sometimes you can benefit from having a handyman "also" do your locks....but they cannot and often do not (or are unable) to warranty their work. There is an old saying, "Pay peanuts and get monkeys", this should apply to anyone seeking to "cheap out" on their families or their colleagues protection. 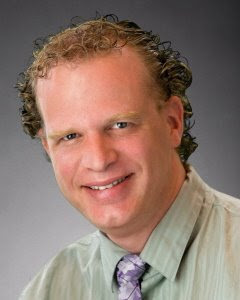 I recently had an article published on respected Internet site EzineArticles.com. It is an honor to have been accepted into a community of authors and people who have had an article published publicly. Why join an article publishing site? The exposure and free advertising that come with perception as an expert in your field are enhanced tremendously by third party facilities that are prepared to scrutinize your works and content and have them available to a broad cross-section of the world wide web. It is another attempt at gaining a wider exposure, without necessarily paying for it. Getting published in EzineArticles.com boosts your credibility and begins the trust cycle with your readership. For many authors, being listed with EzineArticles.com is an excellent way to get started, especially if you are a published author or hope to be published soon. There is a book inside each of us waiting to come out. Having your articles featured in EzineArticles.com builds brand equity for you, your business, and your expertise. It begins or reinforces in your customers' and prospects' minds what you can do for them. Your articles may be viewed by the (MILLIONS of visitors) that use our site every month! We work very hard to deliver a positive, fast and end-user obsessed experience that keeps our fan base returning for more. You become known as the expert by your article and this endears potential customers to you before they even visit your website. There is no better way to "pre-sell" your prospects than article marketing. Having your articles in EzineArticles.com allows them to pre-sell your ideal target prospects without you having to make any cold calls or face-to-face sales appointments to sell your products or services. It's not so much about making sales directly as it is qualified lead generation. We get the pre-qualified visitor to your website and then it's up to you to convert or monetize those visitors. When your articles are accepted in EzineArticles.com, you become recognized as an EzineArticles expert author. This adds prestige and perceived value by others when they view your articles in our site. While this is not the only reason you should submit your articles to EzineArticles.com, it is a great one. It does not matter if you are selling products, services, or an even an "idea". EzineArticles.com can help improve your sales by bringing your business quality traffic and leads via the links in your resource box below the body of your article. Article visitors often turn into customers. Every article you submit to EzineArticles.com is like casting a wider net to reach new customers and traffic that would have never found your articles or website before. In the majority of cases, your articles will be in EzineArticles.com for at least an initial 180 days (6 months); however, many ezine publishers and webmasters who pick up your articles for reprints, including your resource box, will display your articles and links for many years. This means surges of traffic this year and many random spikes and continual traffic over the next decade. We have no intentions at this time to remove any articles after the 180 guaranteed-inclusion days, but reserve the right to keep our site fresh by removing articles that are no longer current. Today, it is fundamental to business success to enjoy a presence on the world wide web. You can pay $$$ for that exposure or with a little patience and confidence in yourself, you can become an author and have your words of wizdom work for you instead. Lock Bumping - The Truth! combination to be changed in seconds, provides second-to-none key controls, offers fast and efficient maintenance and large, virtually unlimited master keying system capabilities! So-called "Master Key" systems have almost become a generic term. 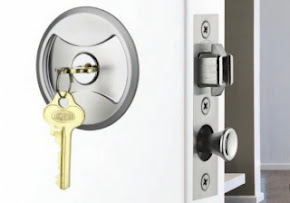 Real Master Key Systems that can incorporate Because it offers switch locks, perimeter locks, filing cabinet locks, garage door locks and virtually any lock on the market today are much rarer, and BiLock is very rare. BiLock offers virtually infinite combinations with tightly controlled security, it gives both the locksmith and the end user confidence and flexibility. It is the Company's understanding of what a true Master Key System requires that has positioned BiLock at the forefront in todays security market. Master Key Systems America, a family owned company, have been servicing, manufacturing and installing BiLock Extreme Security Key Control Systems for over 20 years. Our conveniently located workshop and especially equipped service vehicles are staffed by competent and qualified technicians. Our use of the World's N0# 1 rated master-keying software, Promaster 5, complements our ability to design and maintain even the most complex systems. Combining BiLock with our ranges of premium hardware, offers the discerning commercial or residential property, total security and key control protection. With BUMP KEYS, being discussed very often across the world wide web and instructional videos abundantly available, to teach how easily the keys can be made and lock systems attacked, NOW is the time to thwart any chance of being a victim of bump keys, by installing the widely proven and oldest 100% guaranteed bump proof pin tumbler system on the planet! In more than 50 percent of all residential burglaries, entry is gained through a door. More than 85 percent of break-ins are committed by non-professional burglars, who are usually desperate and dangerous individuals. Fifty percent of all burglaries occur during the day. The average alarm response time (the time it takes the police to arrive) in the US is well over 10 minutes after the burglary has occurred, yet many homeowners trust an alarm for their security. 30% of assault cases and 60% of rapes occur in conjunction with a burglary/robbery, yet many homeowners claim they have nothing to protect. 2 out of 5 burglars have met the occupant at some point and have likely had access to a copy of their keys, yet the majority of homeowners use locks with absolutely no key control. Goods are not recovered in approximately 80% of burglary cases and in 10% of cases reported, the police don’t even respond to the call in person. 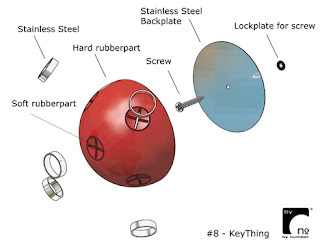 How about this for a modern take on the everlasting security product, the common peephole. Except that this also doubles as a wirelss cctv device. Introducing the First Alert Digital Wireless Security System with Dual Function Photo Frame. No more bulky security monitors on your desk. Now you can view your favorite digital photos and monitor your home or business using the same LCD Photo Frame. Setup is a breeze because you don’t have to lay any cables. Just plug it in and you’re ready to go. Utilizing Advanced Digital Wireless Technology you can mount the security camera within 500 ft** of the photo frame without any interference from other wireless devices. The system is expandable up to 4 cameras. Classic styling and modern convenience combined in this 7" digital picture frame and an indoor / outdoor color digital wireless camera. Pictures are sharp and vibrant thanks to the 480 x 234 pixel LCD panel. Photos can be viewed in an automatic slide show or one at a time with the use of the built-in control buttons or the supplied remote control. Slideshows can be enhanced with music. Video clips can be shown as well. The PH559 digital picture frame offers a classic design with its real wood frame, perfectly suitable for any home or office. The Digital Wireless signal is the latest in wireless technology featuring frequency hopping transmission which enables a clearer picture, point to point secure signal, superior sound quality, longer transmission range through walls and floors (500 ft** range) with no static, and is totally Wi-Fi and wireless friendly. Utilizing Digital Wireless cameras allows the user to cut their setup time in half while increasing the camera distances from the DVR. First Alerts Digital Wireless Cameras have a range up to 500 ft**. You can easily switch from photo frame mode to security camera mode with the touch of a button on the photo frame or included remote control. In addition the signal is completely secure and cannot be monitored by others, unlike traditional analog wireless devices. In addition, the camera is equipped with Night Vision up to 30 ft and can be mounted either inside or outside. With the ability to expand the system up to 4 cameras the PH559 is the sleekest and most versatile security system on the market. Every person uses a key today. So, everyone most likely has a keyring. When you come home, where do you put your keys so you can easily find them next? I am a locksmith with over 25 years in the business, but still today I am constantly misplacing my own keys. I might put them down when I come in, forget where I put them and frantically search and retrace my steps to find them, whenever I need to leave. 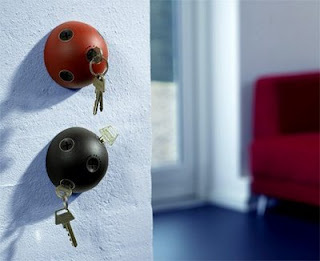 This concept design keyholder is beautiful and simple in my opinion. The rubber slots are able to take almost any design of key and hold them securely in place. 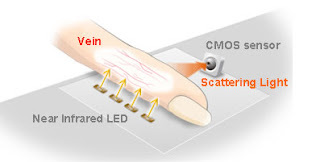 Sony recently released details on a new biometric technology that reads the internal vein structure as opposed to "older" fingerprint recognition technology. The advancement in this technology, enhances potential security applications, immensely. 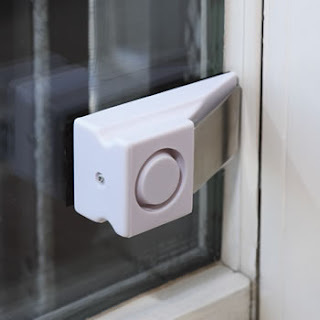 Apparently the size of the sensors have also been reduced to allow for the development of better locking systems including for gates and aluminum style doors. Many aluminum doors across the world are produced with narrow frames. Up until now, fingerprint readers have been too bulky for installation on narrow style doors, hence the slow uptake across the world. With the advent of this exciting new technology breakthrough, I can see on the horizon, the day when keys will be that product of yesteryear. The 5000 year old invention that took 5000 years to be made redundant. You've come home from work, switched off your alarm system, left it off for the evening. Imagine you are home alone. The door is closed. You are in your living room enjoying your nightly activity. Oblivious to the outside world, you didnt hear the door open and the stranger walk in. 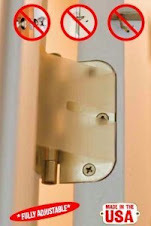 Prevent unwanted intruders. The Wedge is your portable, affordable alarm, sounding a 110Db siren, enough to scare the living daylights out of said intruder. You are home alone. Doors are secure. What about the sliding window or the patio door? Are they secure? The Wedge doubles as a window alarm, loud enough to alert when the slider has been forced. According to a recent survey of prisoners, 85% of all burglars (in prison) stated any loud noise would have stopped them.